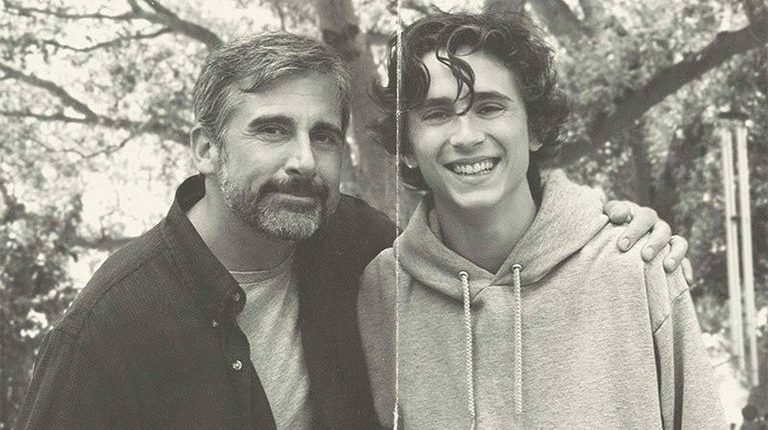 FirstFortnight has again partnered with the Irish Film Institute for an early screening of Beautiful Boy, starring Steve Carell and Timothée Chalamet. Based on the best-selling memoirs from father David Sheff and his son Nic, Beautiful Boy chronicles the harrowing and inspiring experience of survival, relapse, and recovery in a family coping with drug addiction over many years. This emotionally charged depiction of the realities of addiction highlights the affect addiction, recovery and relapse can have on family dynamics. Throughout the movie we see the relationship between Nic (Chalamet), whose experimentation with drugs turns into a debilitating addiction to methamphetamines, and his father David (Carell) become fraught, distant, and at times hopeless. Nic’s journey is in no way linear, the peaks and troughs of his subsequent recoveries and relapses are dotted throughout the film with flashbacks from his happy childhood juxtaposed with his spiral into addiction. Chalamet does a fantastic job at playing a son struggling under the weight of his father’s expectations, grappling to find the will to live sober after years of using hard drugs. Carell gives a harrowing performance as a father attempting to make sense of his sons addiction and who cannot shed crippling feelings of guilt. David attempts to give his son every support in overcoming his addiction, efforts which are not always met with success as we see Nic leave rehab despite his apparent improvements. Thankfully Nic’s story is one of hope, and his memoirs have gone on to help thousands of others in their recovery. Following the screening in the IFI Donald Clarke of the Irish Times hosted a Q&A with Dr Bobby Smyth, Consultant Psychiatrist working in the addiction services, music and film creative Nick Kelly, and Josen McGrane, Board of Directors at First Fortnight. Dr Smyth pointed out that they are seeing less presentations of heroin use in adolescents in the services, noting that their biggest problem currently is cannabis which is causing devastation to many young people and their families. He also noted the separation of services for those with a co-morbidity, with people being yo-yoed between addiction and mental health services. The inclusion of families in the recovery pathway is seen as vital in the services and can improve outcomes, Dr Smyth said family imvolvement is very much encouraged in the services.